So, I recently found out that I have an IgG allergy to dairy and eggs (yeah, I said some swears), which means that parts of these foods are making their way into my bloodstream, and my body has created antibodies to fight them. The reason this happened in the first place is because my gut is leaky (things are getting past the intestinal lining into the bloodstream that shouldn’t be). I’m currently on a protocol right now with my functional medicine practitioner to get rid of some unpleasant bugs that have been bothering me for a while and heal my leaky gut. The good news is that once my leaky gut is healed, I theoretically will be able to eat eggs and dairy again. 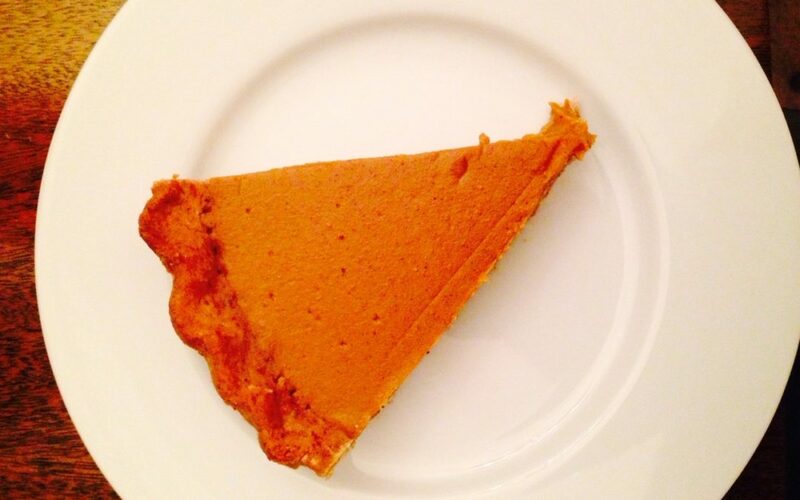 Buuuuuut for now, it meant that I had to find a way to enjoy pumpkin pie minus the dairy and eggs! 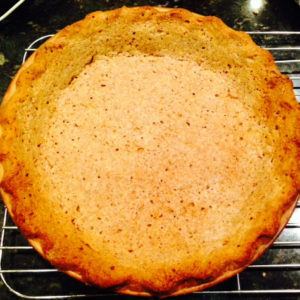 I tried this recipe a few days before Thanksgiving, and it was good, but I wanted a little more spice and a little more creaminess, and I wanted a crust that was more similar to actual pie crust. I adapted a recipe from Beyond Bacon for pie crust that normally uses lard (and I did make a couple extra pie crusts using grass-fed beef tallow for savory meat pies later on! ), using coconut oil instead of lard and pecan meal instead of almond meal (because pecans + pumpkin = heaven). Lastly, I kicked up the spices a notch using roughly the same spice blend from The Paleo Mom’s pumpkin pie recipe, plus I added some cinnamon. The result? Pie perfection. Put coconut oil in freezer for 10 minutes. Add dry ingredients to a food processor and pulse a couple times to combine. Cut up the coconut oil into 1 inch chunks and add to the food processor. Pulse until the coconut oil is broken up into pea-sized chunks. Add 1 tablespoon of ice water, pulse until just incorporated, then add the second and third tablespoons the same way. Dump of the contents into a large bowl and form a flattened disk with your hands. Wrap the dough tightly in plastic wrap and put it in the fridge for 30 minutes or until you are ready to use it. When you are ready to make the crust, preheat the oven to 350° F.
Use a rolling pin to roll out the piecrust on a flexible cutting board or silicone mat, using tapioca flour as needed to keep the crust from sticking. Put the pie pan upside down on top of the pie crust and invert the silicone mat so that it falls off and into the pie dish. This won't be perfect; it will need some work to patch up the crust and make it look pretty! Use a fork to poke holes in the bottom of the crust, then pre-bake the crust at 350° for 20 minutes. Use a shield for the edges if they start to look too brown. Put all the ingredients, except the gelatin and water, into a sauce pan. Use an immersion blender to mix everything together. Turn the temperature up to medium and allow the mixture to come to a gentle boil, then turn down to a simmer for five or 10 minutes. Dissolve gelatin in the boiling water, whisking until completely dissolved. Add the gelatin water to the pumpkin mixture and use the immersion blender to mix everything together again. Allow to cool somewhat, then pour into the prebaked pie shells. Place in the refrigerator until cooled and the filling is set, two hours to overnight. Cut into slices, serve, enjoy! 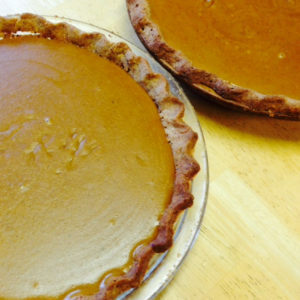 You could also pour this filling into ramekins to make a pumpkin pie custard if you don't want to do a crust.